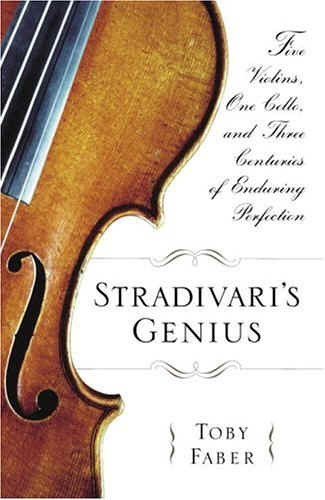 Toby Faber’s Stradivari’s Genius makes a good read. The book seems destined to entice broader audiences into this normally arcane subject much the way the films The Red Violin and Amadeus do. But where those films make no attempt at or pretense to historical factuality, Stradivari’s Genius is based on considerable research on the part of Mr. Faber. That Mr. Faber can weave together so much historical detail within a book that still entertains is admirable. That so much of what Mr. Faber has included reflects the latest historical knowledge and current theories held by violin experts is a testament to Mr. Faber’s knack for ferreting out serious sources. That said, Stradivari’s Genius is far from perfect. From an informed perspective it would appear that Mr. Faber goes too far in presenting historical theory as fact, that he omits the listing of his secondary sources, and that he fails to take into account certain competing theories. When talking of valuations in a market where valuation is at best a murky science, the gaps in Mr. Faber’s first-hand knowledge show through; a $10 million valuation for the 1566 Andrea Amati owned by the Civic Museum of Cremona has no basis in the market. Mr Faber’s claim that all of the surviving Amati cellos have been cut down fails to account for one of the most famous and important examples, the cello of the late Leonard Rose, now the concert instrument of Gary Hoffman. In his exposition about the origins of the violin, Faber makes reference to the Brescian masters and pioneers of luthierie, Gaspar Da Salo and Giovanno Paolo Maggini, but fails to mention their predecessors, Peregrino di Zanetto and the even older Zanetto, possibly the inventor of the string instrument form which Andrea Amati brings to a near-zenith with great prescience in the 16th century, and that Stradivari finally perfects after 1700. Faber’s negative characterization of the Amati arching, “scoops down toward the edges that restrict flexibility and inhibit amplification,” is naive; the Amati aesthetic for arching was different than later archings because the Amatis were building instruments for smaller spaces than the modern concert hall. Part of Stradivari’s genius lies in his bold forward-thinking design which anticipates and encourages larger public concert venues, but this in no way should be construed as denigrating the Amati concept. Stradivari almost certainly could not have arrived at the models he did but for the Grand Pattern Amati violins alongside the Brescian instruments that precede his designs. Faber retraces the long-held theory of Stradivari’s apprenticeship in the Amati workshop, and then exposes some of the problems with it. The more recent theory of Stradivari’s apprenticeship with the woodcarver Francesco Pescaroli has merit, but the evidence to support it is purely circumstantial at this point. Faber presents this theory as highly plausible, based on Stradivari’s work itself, and on the fact that Stradivari resided in a house owned by Pescaroli. However, due to reconstruction and to changes in the survey of the section of Cremona under discussion, the exact location of the Stradivari home in Piazza San Domenico cannot be conclusively confirmed. Faber omits one other extant theory for Stradivari’s apprenticeship: Stradivari might have served as an apprentice in the workshop of Francesco Ruggieri alongside his contemporary, Vincenzo Ruggieri. For what it is worth, the connection between the Stradivari and Ruggieri families runs deep in the decades following. At any rate the truth has not yet been agreed upon, and all of these theories, while fascinating, are as yet mere, informed speculation. Faber asserts that from 1698 one can detect another hand at work in Stradivari’s scrolls. Observations of this nature have been made among experts for years, but a final statement of this nature cannot be reliably asserted. Surely Faber’s statement is based on consultations with the handful of people worldwide, all prominent in the string instrument trade, who are able to make such assertions with credibility. Stradivari’s Genius is well written throughout, but as the book marches on, commentary based on unacknowledged sources rankles. This fun and sometimes interesting book would have been more successful for informed readers if Faber had more clearly identified his sources, and if he had more narrowly circumscribed himself to those facts where he is on firm ground: the known provenances of the violins themselves.